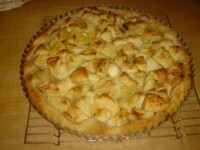 To make an absolutely simple apple tart, first collect a basket of apples from your neighbor’s tree. 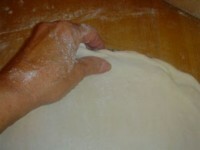 Then, roll store-bought puff pastry (not Pepperidge Farm because it is not made with butter. 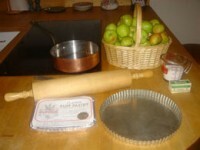 ); cook the apples briefly with a little butter and sugar; and bake the tart in a hot oven. This is what I was served at a French family Sunday dinner — very easy and very delicious; especially, if the apples come from a tree you know or a farmers market. (Cold storage apples never cook as well!) Bon Appetit! 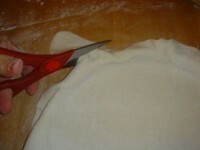 To make the tart shell, roll our the puff pastry on a lightly floured surface and line a 9 or 10 inch tart shell with it. Chill. 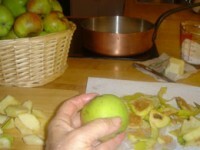 To prepare the apples, peel and coarsly chop the apples. Cook them in a medium sized saute pan with the butter and sugar for about 5 minutes. Transfer to a plate and let cool. 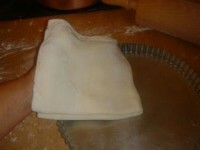 To prepare the tart, Sprinkle the tart shell with breadcrumbs, spread over the apples,and bake on the bottom shelf of a preheated 425 degree oven until the tips of the apples are lightly browned, about 30 minutes. Let cool. Transfer the tart to a serving platter.